After researching the market and receiving information from CPT, we made the decision to implement their solution. 12 years later, we are restoration free and one of the oldest structures protected with CPT’s solution. As a former Exxon Engineering Manager, I've worked with all kinds of Engineers, we knew it would work, and we are extremely pleased. We've created this resource to assist you in better understanding the concrete corrosion process. Why does my concrete have cracks, rust and spalls? Are these cracks and spalls being caused by corrosion? How does corrosion happen inside of concrete? High rise concrete structures designed and built for Condominium use often have exposed balconies, plaza decks, walkways and parking garages. These structures are often located along open water, lakes, rivers and oceans. If you live in a Condominium with ocean front exposure, you are extremely vulnerable to attack from the harsh environment i.e. salt, moisture, humidity, carbon dioxide, etc. Most condominiums we evaluate are at least 15-20 years old and for the most part all have a maintenance plan for taking care of their building. However, 20 years ago, maintaining the concrete was not a significant priority for Homeowners and the exposed concrete structure took years and years of the environment penetrating the surfaces. The result is carbonation (Which lowers the pH in the concrete) and chloride ions from the salt-laden air combine with water, moisture and oxygen to create a corrosive environment. An electrochemical corrosion cell is established and the process of delamination begins. Below are four stages of concrete corrosion that your Condominium will go through; what stage are you at? Chloride induced corrosion is most commonly the root cause for cracks and spalls found in ocean front structures. If you study the diagram below, the pink layer across the top of the concrete slab represents the chloride ions penetrating the concrete surface over time. A good rule of thumb is it can take anywhere from 10-15 yrs before the chloride ions will penetrate the horizontal surfaces making their way to the reinforcing steel. If the reinforcing steel is close to the surface, the timeline for a corrosion cell to begin could be significantly shorter. Think of this pink layer as a disease in your concrete. Keep in mind, that even though you are maintaining your structure today, if there were lapses over the years, the contamination or disease has already set in. The disease will never go away and there are really only a few ways to get rid of the disease – we will discuss those deeper in this section. When steel is used as reinforcement in concrete, a protective oxide layer is initially formed on the surface of the steel due to the alkalinity of the concrete. As long as the oxide layer remains uncompromised, the reinforcing steel will remain in a very passive (Non-corroding) state. However, if the surfaces are not maintained, and the chloride ions reach the steel, they will break down the passivating layer and the process of corrosion begins. See below, as the rebar corrodes, rust forms and can take up to 5-10X more volume than the original steel. This process puts expansive forces on the concrete, which ultimately lead to cracking, spalling, and delamination of the concrete. As this process continues, your concrete structure will go through the four stages of concrete corrosion described above. Left untreated, the process continues until the concrete becomes structurally unsound. 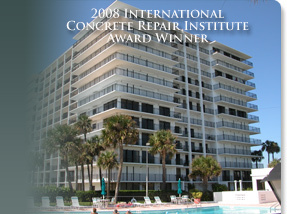 It is our opinion that corrosion is the disease or root of your concrete cracking and spalls. As discussed above, living in a Condominium on the ocean is a dream, however, the structure is surrounded by a harsh ocean environment and it is only a matter of time before the corrosion process begins (Typically 10-25 years). Remember making trips to the beach for the day– only to go home and visibly see the thick film that the beach environment left on your vehicle? That film is the residual of salt laden air, humidity, heat, moisture, etc. Your condominium is exposed to this day after day after day. Since Condominiums typically fall short in maintaining their concrete over long periods of time, those chloride ions end up penetrating the concrete, reaching the reinforcing steel and destroying the protective oxide layer. Having said that, steel is a man made substance produced from iron oxide. When steel corrodes, it reverts back to its original state of iron-ore and starts to expand as much as 5-10X its original volume. This expansion will start to put forces on the concrete ultimately causing your concrete to crack and spall. The corrosion taking place is an electrochemical process whereby a material reacts to the environment in which it is placed. With that said, this is a very important concept to understand – if you fix a small area, you are only treating the symptom and not the disease. Remember, ALL of your concrete has the disease (Chloride contamination) and if you do nothing to address all of the other concrete, your Condominium will have the same types of cracks and spalls again in 4-6 years. Going back to your high-school science days, if we eliminate any one of the four above, the corrosion cell is stopped. In the picture below, you can see the area corroding is the anode or anodic zone. To the right of the anode is the cathode or cathodic zone – the part of the steel that is not corroding. The metal or reinforcing steel serves as the electronic path between the anode and cathode. Finally, the concrete in your balcony or walkway slab serves as the electrolyte (vehicle in which electrons can travel). You can see that the voltage differential between the anode and the cathode in the corrosion cell causes a DC current to flow. This DC current flows from the anode through the concrete (electrolyte) to the cathode and back to the anode through the metallic path (reinforcing steel) completing the circuit. Further, you can see the anodic area is discharging current via the electrolyte as it is corroding and the cathode that is receiving the current does not corrode. This is important to understand: CPT’s system takes the anode out of the equation by placing two artificial anodes on the top of your concrete surface. By doing this, we allow those artificial anodes to be consumed versus the reinforcing steel in your concrete. Remember what we just explained above, when corrosion is occurring inside your concrete, the anode is discharging a DC current to the cathode and the cathode does not corrode. Subsequently our system sends a DC current 24X7 to the reinforcing steel making the entire reinforcing steel a cathode – thus cathodically protected. Cathodic protection has been around since the 1800’s. It is a method to reduce corrosion by minimizing the difference in potential between the anode and cathode. As described above, the areas of a metal discharging current (Anode or anodic zone) to the environment corrode, whereas the areas receiving current (Cathode or Cathodic zone) from the environment do not corrode. This is accomplished by applying a current to the structure to be protected from an outside source. If we can control and distribute enough current, the entire structure will be at one potential which eliminates anode and cathode scenarios. The bottom line is if the reinforcing steel receives current at all times it can be made cathodic and not corrode. CPT’s cathodic protection system provides the 24X7 direct current (DC current) from an external source to the reinforcing steel. CPT’s system is applied to the entire concrete surface and if the current is proportionately distributed, corrosion is stopped and the structure is considered “cathodically” protected. Remember, CPT’s proprietary system installs two artificial anodes on the top of the concrete surface. By doing this the artificial anode corrodes or is consumed versus the reinforcing steel. There are basically two types of cathodic protection, sacrificial and impressed current. Sacrificial is a short-term solution (4-6 yrs) whereas impressed current is a long-term solution (15-25 yrs). CPT’s system(s) falls under the long-term category.